Did you download the lesson VM? You will need to already have some files downloaded. Without these you are going to be in trouble, please make sure you downloaded them before the lesson, details are at index.html. Cleaning out sequence data with trimmomatic. Each of the weird characters represents a number according to the ASCII look up table, where numbers are linked to characters, so ! means 33 and " means 34. These numbers are generally Phred scores, which encode the likelihood of the base being wrong on a log scale. We can use this quality information to assess how well our sequencing went. Along with sequence quality information we should also assess the composition of the sequence data. A program called FastQC is useful for this. FastQC presents a range of plots and summary statistics, you need to provide it with Fastq data. This is the per base sequence quality. The plot shows along the x-axis the position in the read and for each position in the reads it shows a box-plot of all the quality scores at that position. Noticeably in this figure, the box plots to the left have much higher and tightly grouped quality scores than those on the right. 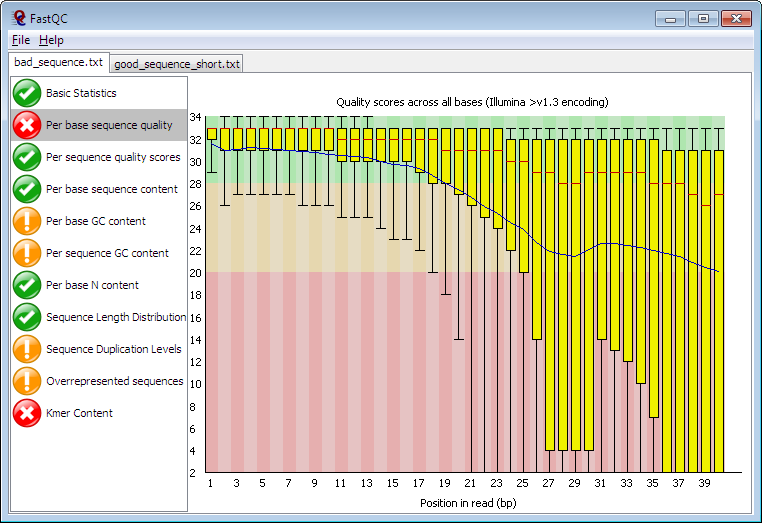 This is typical of Illumina machine sequence, the quality decreases the further you get along the read. As you can infer from the red region of the plot background, Phred scores less than 20 are generally not trusted. We may (or may not) decide that we need to get rid of the lower quality sequence. At the individual sequence read level, we can discard entire sequences if part is too poor or trim the read leaving the good part alone. One system for doing this is Trimmomatic which can perform a variety of trimming operations on sequence reads. It can remove parts of reads from the left or right sides up to quality thresholds - it uses a sliding window average, rather than just a harsh cut-off. If we do carry out trimming, then we may end up with lots of reads of different lengths - this can be a problem for some aligners and downstream tools, so sometimes trimming isn’t the best strategy, we have to make context dependent decisions. 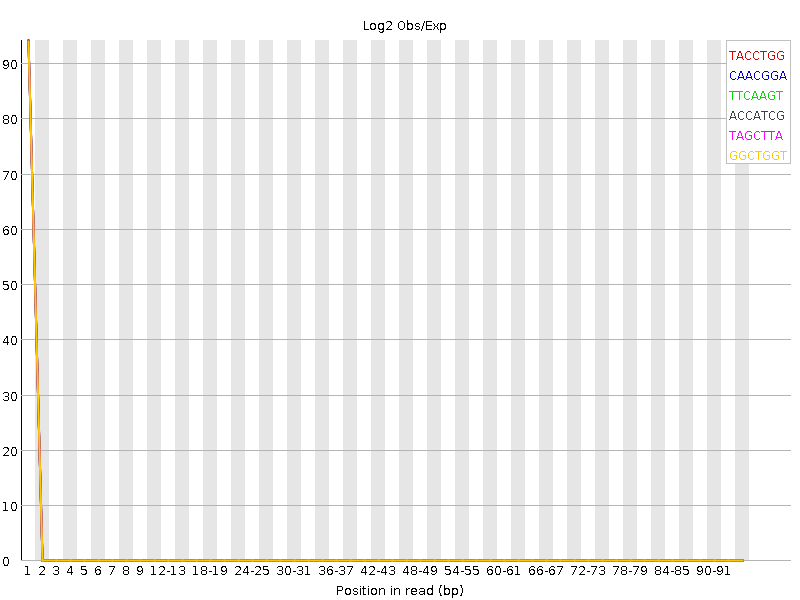 At the sequence sample level (e.g, the read file level), we may discover that our read set is not good. Reports from FastQC like the kmer content plot can show sequence problems, in this graph there is an over-representation of particular kmers at the start of the sequence that shouldn’t be there. Your task now is to load up Galaxy and run some reads through quality control and trimming, prior to downstream use. Start VirtualBox by double-clicking it’s application icon. Use File .. Import Appliance and select the GCC2015-CandiSNP.ova VM file. Start a terminal cd /var/git/galaxy, sh run.sh, navigate to localhost:8080 with the web browser. Use the reads in the QC Shared Data library. You will find the FastQC tool in the tool list under HTS QC. The reads are single ended from a mutagenised Arabidopsis thaliana (a model plant). They are Illumina Whole Genome Shotgun reads so don’t have any multiplex adapters and the plants are grown in sterile culture so we aren’t expecting contamination. How many reads are you using? What sort of output files do you get from FastQC? What should you do with these files? Do they represent a scientific control that could be published? Is there any evidence of contamination? Which report tells you? If there is, which sequence is contaminating? Which of the four files is the best? Find a trimming strategy to get rid of contamination you observed in section 2.1? How could you filter on size? If you needed to pass only good quality, full length sequences to the next step?